This is the first in a series of posts highlighting how Shion users around the world use the system to automate their homes and other environments. If you are using Shion and would like to show off your setup, please send an e-mail to shion@audacious-software.com. 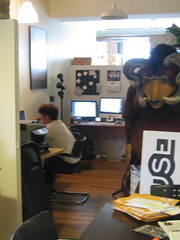 Several months ago, I began working on Audacious Software as a full-time venture when I rented a small 7 foot by 9 foot space from my friends at The House Theatre of Chicago. It was a nice environment to bootstrap the development of the new version of Shion and it had the advantage of also becoming Audacious Software’s first live testing lab. Last month, the theatre company and I relocated to a new space down the hall and I tripled my space in order to handle the growing amount of computers, test equipment, and other devices that this growing enterprise is generating. Along with the desks and computers, came the automation equipment as well. Once I hooked everything up, the new office became Testing Lab 2.0. 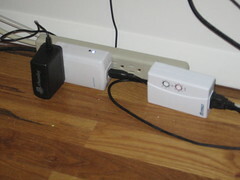 In this environment, I’m using a mixture of X10 and INSTEON equipment to control the environment. On the INSTEON side, I have hooked up a number of LampLinc modules for the theatre company members, while my local lights are controlled using X10. (Since I don’t have a phase coupler, X10 devices only work on my side of the office.) I use a relatively recent Intel iMac (Dec. ’08) to host the Shion application. 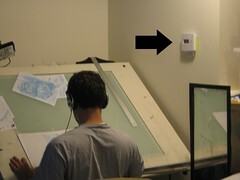 Controlling the temperature is a programmable Venstar unit situated next to our resident comic book artist’s desk. Since the more recent betas of Shion include support for these devices, I’ve enjoyed controlling the air conditioning as Chicago’s summer creeps in. Lately, I’ve been using the new testing lab that I’m building to test Shion’s compatibility with Mac OS X 10.4 and to put the new remote control features test. So far, everything’s been working great on these platforms. In terms of future plans, I’m working on building a faux-window in the office so that I can begin working on drapes and blinds support for Shion. Once that’s been handled, I’m planning to see if we can’t rig up a watering system using INSTEON sprinkler systems to keep our green friends hydrated.